Seems easy enough but I can't seem to figure it out. Rail seems to work fine, I can move it in a program. In attached RDK file, prog3 is what I want. Since you have a robot and a linear rail (mechanism) you have to pay attention to what mechanism you are currently using when you define new targets and programs. After you create a target you can right click it (image) and select the linked robot. Alternatively, you can select the robot before adding the target and the target will be associated to that robot. The same issue arises if you have 2 or more robots. Also, when you teach a target with respect to a specific reference frame you must make sure that it is the reference currently activated (green dot on the icon). 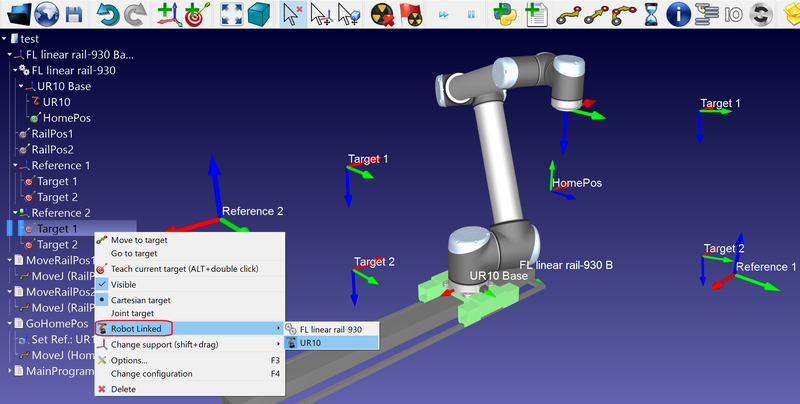 You can manage external axes such as a linear rail in two different ways: As a separate mechanism (like you did) or synchronize it with the robot. Synchronizing it with the robot means that the robot manages the position of the linear track as an additional axis. To synchronize external axes in RoboDK you can right click the robot and select Synch External Axes.